Excellent for longer label applications. These units are designed to have more of the label exposed for faster removal from the dispenser. 250 for up to 2 1/2", 450 up to 4 1/2", 750 for 7 1/2". Special 9" model also available. Options offered: no air, 7" wide options, front/back options. 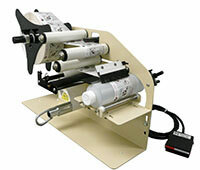 These label applicators are very versatile and offer a multitude of opportunities to solve your labeling applications. We strongly recommend advising all labeling perimeters and we will involve a factory engineer to insure the best solution. Email by clicking here. These label printer/applicators provide solutions to your labeling date coding applications. Printers are available for several models. We now install our Smart Jet Plus ink jet printer on several models. Call for more info.